Healthcare Mergers and Acquisition (“M&A”) activity continued its march forward with a record setting year in 2018 by deal volume. When excluding the managed care mega-deals in 2015 and 2017, the dollar value of healthcare transactions has also continued to increase annually since 2012. Among the major transaction trends in 2018 were mega-deals, cross-industry integrations, public companies moving private, private equity firms driving multiples up, disruptive partnership models, and continued interest from payors buying providers. Providers continue to seek consolidation in an effort to take advantage of the economies of scale necessary to meet the goals of the “triple aim”, namely, increase access to care, decrease cost, and improve the quality of care. Changing technology requirements, the future of the Patient Protection and Affordable Care Act (“ACA”), and the implementation of value-based payments and alternative payment models continue to drive uncertainty in the industry. However, while buyers tend to proceed cautiously in the face of uncertainty, large regulatory changes affecting healthcare providers have historically been accompanied by an increase in M&A activity. 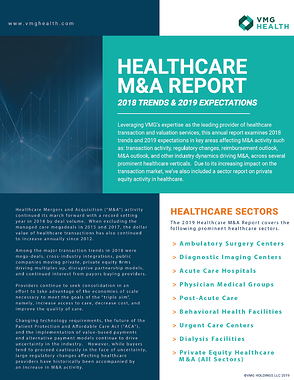 Leveraging VMG’s expertise as the leading provider of healthcare transaction and valuation services, this annual report examines 2018 trends and 2019 expectations in key areas affecting M&A activity such as; transaction activity, regulatory changes, reimbursement outlook, M&A outlook, and other industry dynamics driving M&A, across several prominent healthcare verticals. Due its increasing impact on the transaction market, we’ve also included a sector report on private equity activity in healthcare.